A man and his wife moved back home to Cork in Ireland from London. 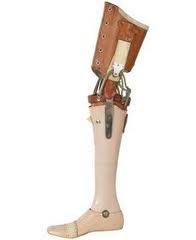 The wife had a wooden leg and to insure it in Britain cost them £2,000.00 a year! When they arrived in Cork, they went to an insurance agency to see how much it would cost to insure the wooden leg. The husband was shocked and asked why it was so cheap in Ireland to insure, since it cost him £2,000.00 in England!